Sunny days have turned into grey skies, but the West End is still host to numerous outdoor events and activities. Most recently, Stanley Park was host to the Trees Are Portals event, an afternoon of Coast Salish and Squamish Nation collaborative performance by Aeriosa and the Spakwus Slulem Eagle Song Dancers. This week’s winning photograph by Pierre (@verse45) is from the Trees Are Portals performance and captures the stunning colours, patterns and movements of a dancer. 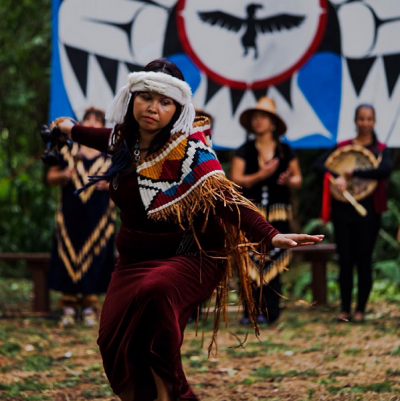 Stanley Park was once a traditional home of First Nations communities and events such as this help to honour their history and traditions. Pierre has won a gift certificate for dinner at La Brasserie and dessert at Styo Frozen Yogurt, thanks to contest partner Intracorp and The Jervis. Additionally, Pierre is now in the running for the chance to win the grand prize of a new Electra Loft bicycle from Denman Bike Shop at the end of the summer. Share your West End memories and adventures on Instagram and Twitter – but don’t forget to tag your images with #WeAmaze, @WestEndBIA and @IntracorpCanada. There are only two weeks left for a chance to win!